Partial side view of the town of Pangim, or Nova Goa, along the river. (Profil d’une partie de la ville de Pangim, ou Nova Goa, donnant sur la rivière.) J. Jacottet, lithograph after Bayot ; L. Caraguel and H. Bridet, drawings ; Arthus Bertrand, editor. In : “Voyage à la côte orientale d’Afrique” / surveyed and written by Ch. Guillain, folio-atlas, plate 14; 1856-1857. Eight years after his extended travels, Charles Guillain produced a substantial three-volume work, with an accompanying atlas folio of engravings and maps, that has become a standard source for historians of pre-colonial East Africa. Documents sur l’histoire, la géographie, et le commerce de l’Afrique orientale, is considered a remarkable compilation of what knowledgeable Europeans knew of eastern Africa’s history and societies at the time. Its first volume includes texts and commentary on the early Arabic and Portuguese sources for eastern Africa. 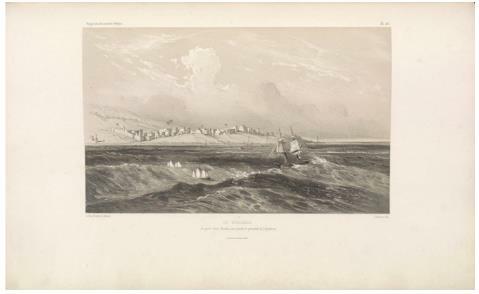 Volumes Two and Three contain the account of Guillain’s travels along the coast from Mozambique to the western coast of India. Despite the high quality of Guillain’s travel narrative with frequent accounts of local history and current political events, as well as occasional discussions of local customs and personalities, his contributions as an historian as well as a contemporary chronicler remain understudied. Panoramic view of Mogadishu, from our house’s roof terrace. E. Cicéri, lithograph after Bayot ; Arthus Bertrand, editor. In : “Voyage à la côte orientale d’Afrique” / surveyed and written by Ch. 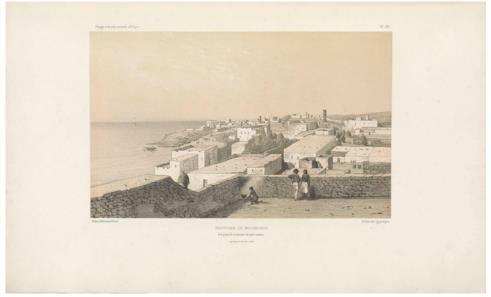 Guillain, folio-atlas, plate 23; 1856-1857. Charles Guillain was not the first nineteenth-century European to report on his visit to the east coast of Africa. Aside French and American traders’ periodical visits, British officers and diplomats including Henry Salt (1809-10), William Owen (1822-24), Frederick Forbes (1833), John Studdy Leigh (1838-39), and William Christopher (1843) had all published brief accounts of their travels in the region. While providing valuable, mostly first-hand descriptions of the coastal towns, they tell us nothing about their local informants. In contrast, and according to Lee Cassanelli, Guillain’s narrative clearly marks the start of a trend toward more systematic ethnographic, linguistic, and historical reporting on indigenous people by European observers. Commerce was rapidly expanding in nineteenth-century eastern Africa and European travelers, alongside small communities of Arab and Indian traders were part of a growing cosmopolitan world of merchants with their own specialized economics and political knowledge. These merchants almost certainly provided Guillain with his entree into African coastal societies, and it was most likely from them and their local African business associates, that he obtained his earliest information about local customs and traditions. View of Geledi, on the Denoq River. E. Cicéri, lithograph after Bayot ; L. Caraguel and H. Bridet, drawings ; Arthus Bertrand, editor. In : “Voyage à la côte orientale d’Afrique” / surveyed and written by Ch. Guillain, folio-atlas, plate 26; 1856-1857. Charles Guillain was firmly in the utopian philosophical tradition of St Simon, whose followers helped shape French colonial thought during the first half of the nineteenth century. Among the major presuppositions of the St. Simonians -elements of which they clearly shared with many other European thinkers of the period- were a belief in global trade as the central vehicle for establishing links among the world’s civilizations and a conviction that the industrially advanced societies needed to associate themselves with the less advanced ones first through contact with local merchant interests, and then gradually through the penetration of the hinterlands. The ultimate aim was to create a “universal family” where improved production and a fairer distribution of wealth would benefit all peoples (Reuillard, Michel. 1995; Cassanelli, Lee. 2006). Charles Guillain’s agenda as an agent of the French Ministère de la Marine was quite transparent: it was to promote French commercial interests in the Indian Ocean, and more specifically to identify ports along the East African coast which could provide the merchants of the French-occupied islands of Mayotte and Bourbon (today, Réunion) with opportunities for trade and investment. As a St. Simonien, Guillain took every opportunity to associate himself directly with prominent local merchants, spending fortnights in their homes whenever he and his fellow officers put into ports. He spent a good part of his time in East Africa conversing through a variety of interpreters, with traders and their political patrons, from the Sultan of Zanzibar and his representatives to the livestock exporters of Brava and Mogadishu, shaping his understanding of the role of commerce in Africa’s history as well as its potential for the future. The Ducouëdic, anchored off Merka, to board the crew of the expedition. Sabatier, lithograph ; L. Caraguel and H. Bridet, drawings ; Arthus Bertrand, editor. In : “Voyage à la côte orientale d’Afrique” / surveyed and written by Ch. Guillain, folio-atlas, plate 40; 1856-1857. On 27 April 1848, in the immediate aftermath of the French Revolution of that year, slavery was abolished throughout the French empire. 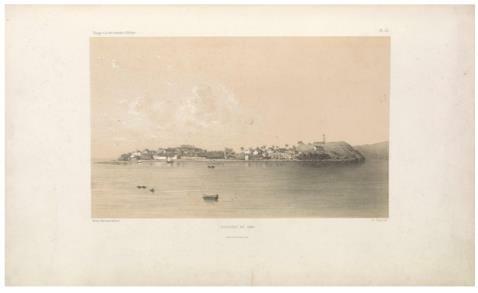 The only French colony where slavery was already abrogated was Mayotte in the Comores (annexed in 1843) where the decision was officially taken in December 1846, partly to avoid trouble with the Royal British Navy anti-slavery squadron, partly to provide laborers for the French plantation owners and the colonial administration. In France’s Indian Ocean colonies, planters were unwilling to pay competitive wages, while the freed slaves were disinclined to work for their former masters. Attempts to recruit European and Chinese workers also failed. The British, already exposed to the abuse of Indian indentured workers in their own colonies, refused to allow their French rivals access to the vast pool of labor in their Indian Empire. Inevitably, Africa thus remained the main source of manpower. The French therefore resorted to buying slaves, ostensibly freeing them, providing them with a contract “voluntarily” signed, and shipping them off to Mayotte in the Comores, Nossi-Be off Madagascar’s northwest coast, and Bourbon (Réunion) to serve in conditions which differed little from slavery. During that crucial period Charles Guillain was recovering from severe illness contracted during his first expedition along the coasts of east Africa and western India. He was stationed at Mayotte for several months in 1847 where, as a naval officer of the Ministère de la Marine, he presided over the Commission of Evaluation of the Emancipated Slaves (Commission d’évaluation des esclaves affranchis). For a total of twenty-one sessions, between July 19 and August 12, 1847, Guillain and the other seven members of the committee evaluated the case of 2,322 slaves. Among them only 746 accepted their emancipation following the conditions dictated by the French government. Yet they were still unwilling to work either for the planters or the government, resulting in a social situation which led to the 1856 uprising and the failure of the attempted colonization of Mayotte. In : “Voyage à la côte orientale d’Afrique” / surveyed and written by Ch. 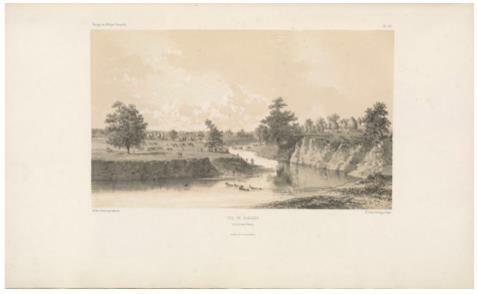 Guillain, folio-atlas, plate 53; 1856-1857. Following Napoleon’s defeat at Waterloo in 1815, France was stripped of all its overseas’ possessions at the exception of a few unimportant islands in the Antilles and the Indian Ocean. Therefore the nineteenth century saw France destined to begin again, in a quest to create an empire of vast geographical extent. In the Indian Ocean, Great Britain firmly controlled the maritime activities while continuing its actions to abolish the slave trade. By 1840, the United States became the most important commercial foreign power in the region trading with the Sultan of Oman who had just established its capital on the island of Zanzibar. France and its Ministère de la Marine slowly revived plans to establish commercial treaties with regional rulers, to consistently supply a servile agricultural workforce to the French and Creole land proprietors, to acquire new territories such the islands of Nossi-Bé (1841) and Mayotte (1843), and ultimately to prepare for the conquest of Madagascar (1895), considered the French colonial eldorado, “our own Australia” as mentioned by Charles Guillain himself. 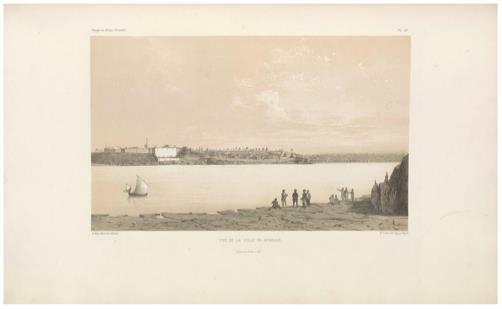 View of the town of Mombasa. In : “Voyage à la côte orientale d’Afrique” / surveyed and written by Ch. 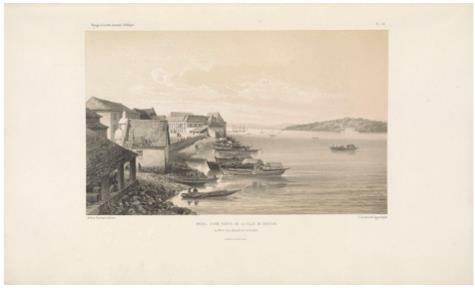 Guillain, folio-atlas, plate 44; 1856-1857.